The environmental impact of sanitary products and the possibility of weed killer in tampons certainly is a good enough reason for me to re-consider the brands I use once a month. I had recently discovered Veeda at Boots and then coincidentally was contacted by them. If you were not already aware many mainstream tampons are a blend of cotton and synthetic materials. You're basically putting into your body a product which could possibly contain dioxins from the bleaching process, pesticide and herbicide residues, synthetic chemicals, artificial fragrances, and dyes. Veeda tampons are like any other brand from the way they look to the performance but the difference is they are made with 100% natural cotton. 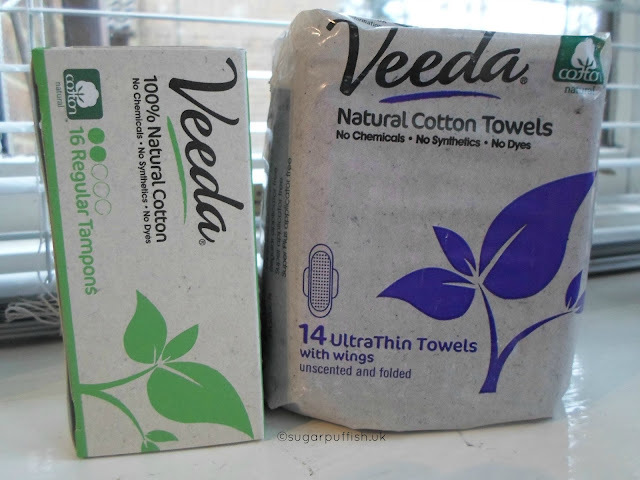 Veeda initially caught my attention because the range includes the choice of tampons with BPA free plastic applicator. Here's where it gets TMI......I hate those cardboard applicator, I know they are better for the environment but they are uncomfortable. Majority of the time I favour using towels and the Veeda ones are comfortable and secure. No bunching and the wings have a good hold unlike other brands. The biofilm packaging on the Veeda towels is biodegradable and breaks down in six to twelve months. For me, regular pads are only suitable for lighter days. I find that my heavy periods are what holds me back from making the full switch to "greener" products because performance in comparison to Bodyform and Always isn't adequate. Sadly, I wasn't able to get hold of the super towels in time to include them in this review. Overall I was very happy to use Veeda products and I would look to buy more in the future. For now, Veeda is available at Boots, Ebay, Amazon and directly through their website. Never heard of Veeda before but it's good to hear you can find them in Boots.What are your thoughts on them not being certified organic? Preference for organic is up to the individual, swings and roundabout where I am concerned, these products have other qualities which outweigh the synthetic alternatives and I'd rather promote the idea of switching than dwell on certification. You are right Sarah, it's important for people to switch to natural products first as they are much better than synthetic. I guess certified organic products can always come at a later stage if desired. It makes me so happy you can find these things in Boots. I normally get mine from Wholefoods or Ocado. I haven't heard about Veeda before though.